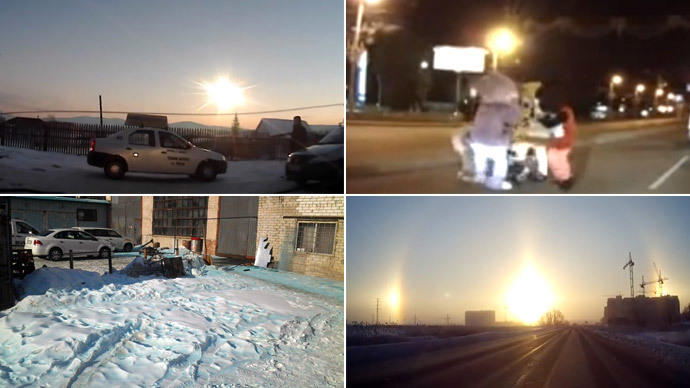 From a giant meteorite unexpectedly falling from the sky to a three Suns optical illusion - the Russian city of Chelyabinsk has become the world’s premier place for truly out of the blue OMG! moments. RT gives some insight into the recent madness. For centuries, Russia’s Chelyabinsk Region, located on the border between Europe and Asia, has been a defense powerhouse, arming the Tsars’ forces and establishing the Soviet Union's formidable nuclear arsenal. But the region’s rep for military muscle is not what’s been turning heads as of late. No, when it comes to packing in as many ‘oh my God! Did you see that?’ moments into one place, Chelyabinsk is the undisputed champ. In 2013 a meteorite swan dived over the city. And not just any meteor. No, it was the largest piece of flaming space rock to hit the earth in more than a hundred years. On February 15 the skies were illuminated by a flying object that exploded a few times, just enough to make the city’s gritty residents turn their heads. “At first I saw a huge bright fire up in the skies, and then came a loudexplosion that not only shattered the windows, but blew out the window frames,” resident Taisiya Alabuzhina told RT. Luckily the explosion occurred about 30 to 40km over Chelyabinsk and the space body itself didn’t make an unwelcome crash landing smack dab in the middle of the city. There were no casualties, but about 1,600 people received minor injuries, mostly from fragments of shattered glass. Although the meteor was relatively small, some believed its blast was comparable to the power of a nuclear bomb. NASA said the shockwave force was equal to a 500-kiloton explosion – 30 times the Hiroshima blast. The shockwave was so powerful that it traveled some 85,000km, circling the globe twice over the course of three days Superman-style. The biggest fragment of the meteorite weighed in at around 570 kilograms and was found in Lake Chebarkul, 90 km from Chelyabinsk. The chunk of the cosmic body even got its own fan club, with some going as far as to worship it and establish the so-called ‘Church of the Meteorite’. Paranormalist Andrey Breyvichko, the founder of the circle believes that it contains “a set of moral and legal norms that will help people live at a new stage of spiritual knowledge development.” Moreover, he claims that the meteorite is so powerful it could actually trigger the Apocalypse. While his woo-woo take on the meteorite is…special, it would probably be fair to say that ‘holy’ was the first word to come out of a lot of people’s mouths when they first saw that thing hurdling overhead. So did Chelyabinsk somehow leave earth and become part of a ternary solar system? Not exactly. Rather, the triple suntriple sunwas actually an optical illusion which is sometimes called a winter rainbow; produced by ice crystals in the winter air. The symmetrical patches of light, tinged with red on the inside, are called mock suns, parhelia or sundogs. So seriously, forget about double rainbows, the winter rainbow is where it’s at! Your parents always warned you not to eat the yellow snow, but what about the blue snow? That’s right, if a triple sun wasn’t enough for the month of February, strange, Smurf-colored snowflakes fell down on the city’s streets, just in case the residents weren’t already freaked out enough. But before anyone could start a cult and herald the blue snow as yet another sign of the end times, officials figured out that it was actually caused by a spill at a factory making dye for Easter eggs. So what else has been going on in the city as of late? According to the web, an alarm clock cut off a girl’s head, a Chupacabra was seen roaming the streets, a man attacked a bear, and Mickey Mouse, SpongeBob, and Luntik put a beat down on a driver??? Seriously, go home Chelyabinsk, you’re drunk!